NEW YORK (AP) — A rare original copy of President Abraham Lincoln's Emancipation Proclamation sold Tuesday at a New York auction for more than $2 million. It's the second-highest price ever paid for a Lincoln-signed proclamation — after one owned by the late Sen. Robert Kennedy that went for $3.8 million two years ago. The latest copy of the 1863 document ordering the freeing of slaves, which was auctioned at the Robert Siegel Auction Galleries, went to David Rubenstein, managing director of The Carlyle Group investment firm. The American seller remained anonymous. The $2.1 million purchase price includes a buyer’s premium. This price and the one for the Kennedy copy are the highest ever paid for the proclamation, reflecting a “growing appreciation for documents that capture the most important moments in our history,” said Seth Kaller, a dealer in American historic documents and expert on the Emancipation Proclamation; he’s handled eight signed copies. The document will go on public exhibit somewhere in Washington, he said. The name of the institution is yet to be announced. 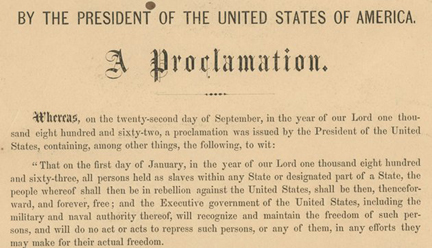 Lincoln signed the proclamation during the Civil War, freeing all slaves in states then in rebellion. The proclamation also provided a legal framework for the emancipation of millions of other slaves as the Union armies advanced. Forty-eight copies were subsequently printed, with Lincoln signing all of them. The president donated them to the so-called Sanitary Commission, a precursor of the modern Red Cross that sold the documents privately to provide medical care to Union soldiers. A century later, President Lyndon Johnson invoked the proclamation while presenting the Voting Rights Act to Congress. He said equality was still an unfulfilled promise for black Americans. A total of nine proclamation copies have been sold publicly in the past 40 years, Kaller said. In 2010, Robert Kennedy's family auctioned his copy for $3.8 million at Sotheby’s. Kennedy, who was assassinated in 1968, had purchased it for $9,500 in 1964, when he was U.S. attorney general. Only about half of the 48 proclamation copies have survived, Kaller said.